Barbie comes in a curvy model now, Sports Illustrated features full-size swimsuit models, and fashion designers are focusing more on curvy women. 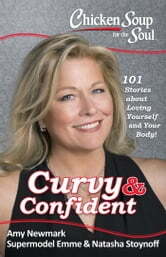 There’s a healthy conversation going on now about body image and self-esteem, and Chicken Soup for the Soul is part of it, with this collection of 101 stories celebrating all the different body types that women have and how we can all be curvy and confident—fit and fabulous within the body types we were issued at birth! Supermodel EMME, the world’s first curvy supermodel, an advocate for women and a spokesperson for all the curvy and confident women out there, shares her own story and introduces us to women who have learned to be fit, happy, and confident about their bodies. These personal stories from 100 different women will leave you feeling empowered, beautiful, and loving your look. You’ll read stories about how women developed their confidence and dealt with societal and media pressures, about attitude adjustments and acceptance, and about being healthy and loving yourself just the way you are! This compilation of real life stories offers a wonderful contribution to the current social conversation about body image and self worth. I am a proud contributor to this Chicken Soup volume (story #3 - A Confident Triumph) and a life-long fan of the series. Once again Chicken Soup has touched our hearts and challenged our minds.